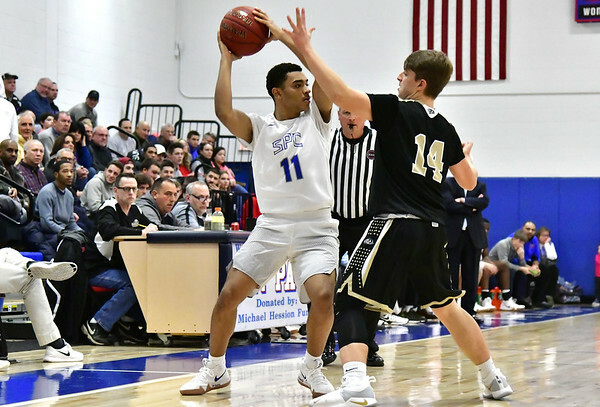 NAUGATUCK - Having already clinched a state tournament berth, the St. Paul boys basketball team was unable to improve its seeding on Friday night, suffering a 61-54 loss at Naugatuck. ST. PAUL: A.J. Brooks 1-1-3, Noah Waters 6-0-16, Kevin Ashworth 1-0-2, Donavan Symes 6-4-16, Tyler Garry 4-0-11, Jack Noli 1-0-3, Joe Leone 1-0-3, Rudy Otero 0-0-0, Will Barton 0-0-0, Ryan Sulvester 0-0-0, Christian Peterson 0-0-0. Totals: 20-5-54. NAUGATUCK: Derrick Jagello 3-0-7, Gwayne Fisher 3-1-7, Jean Lukau 2-0-4, Ese Onakpoma 3-1-8, Avery Hinnant 3-4-10, Shane Carey 2-0-4, Keywan Garris 1-0-3, Andrew Robertson 6-2-18. Totals: 23-8-61. Three-point goals: Waters (SP) 4, Garry (SP) 3, Noli (SP), Joe Leone (SP), Jagello (N), Onakpoma (N), Garris (N), Robertson (N) 4. Records: St. Paul 8-10, Naugatuck 14-4. Posted in The Bristol Press, St. Paul on Friday, 8 February 2019 21:43. Updated: Friday, 8 February 2019 21:46.